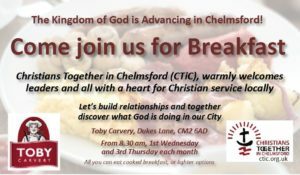 A ‘Chapter’ of the Full Gospel Businessmen (FGB), launched in Chelmsford summer 2017. The FGB hold monthly dinner meetings, usually on the fourth Tuesday each month, 7pm for 7.30 pm, at the Saracen’s Head Hotel, High Street Chelmsford. The dinners, open to both men and women, are where remarkable NEW LIFE stories are shared! At the end of the evening there is an opportunity to receive prayer, especially for healing. Dress code is informal and a two course meal, with tea or coffee is £15. Details of each monthly meeting appear on our Events Directory – click here. 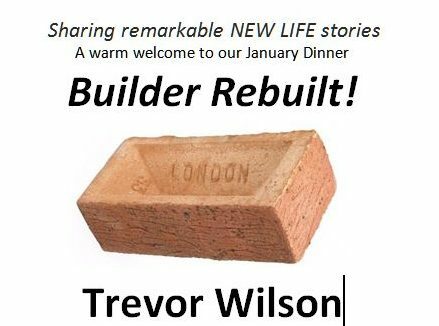 This month, on Tuesday 22nd January, FGB Chelmsford warmly invite you to their dinner where the speaker is Trevor Wilson. As a plasterer and carpenter Trevor couldn’t find work in England and went to Germany, building a power station on the Rhine. He enjoyed drink and drug binges in Amsterdam, struggling to overcome a ghost from the past. His first marriage failed, and his second wife was pregnant with twins. Maybe his life was finally coming together? Come along and hear Trevor’s story. Contact Andy Parker on 07817 873562 or email fgb.chelmsford@yahoo.com to make a booking. Previous Previous post: Your Street Pastors need you!